Ontario Fishing Directory - Lures and Tours Blog: Wil Wegman Presents Lake Simcoe Hard Water Fishing Tips February 2013! Wil Wegman Presents Lake Simcoe Hard Water Fishing Tips February 2013! Seeking Lake Simcoe Ice Fishing Tips? Try Wil Wegman Fishing Finesse! Ice Fishing Lake Simcoe? Increase your fishing success - catch Lake Simcoe fishing finesse tips from pro-anglers Wil Wegman and Gerry Heels Tuesday, February 7th, 2013 at The Briars in The Town of Georgina. 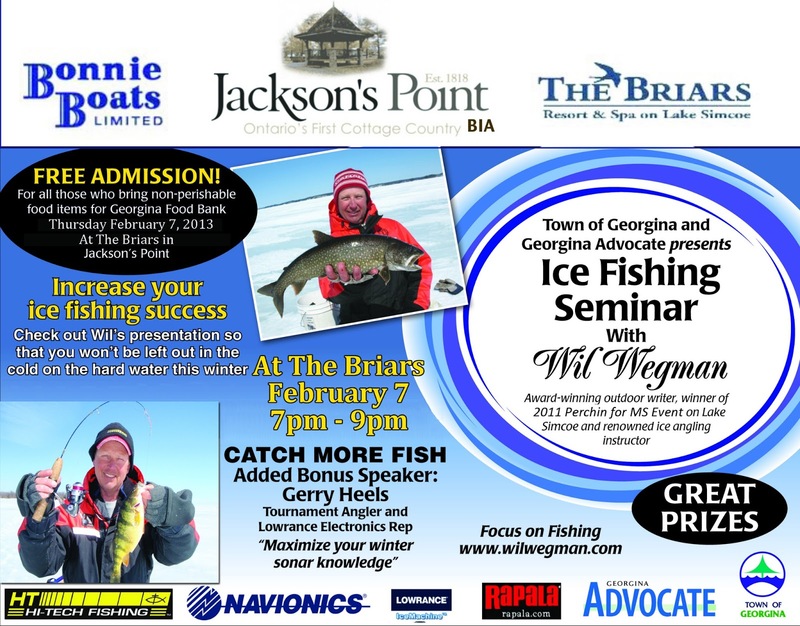 Wil Wegman Popular Georgina Ice Fishing Seminar Returns! 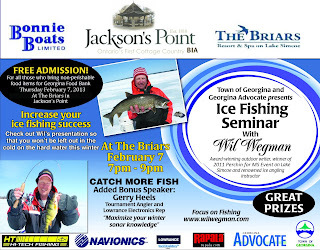 Lake Simcoe: Former Focus on Fishing newspaper columnist for the Georgina Advocate and award winning outdoor writer Wil Wegman will host his 2013 ice fishing seminar in the Town of Georgina, Thursday February 7th 2013 from 7pm to 9pm hardwateranglers will gather at the legendary Briars Resort, 55 Hedge Road, Jackson's Point to learn Lake Simcoe ice fishing tips and tricks and win great door prizes. Wil Wegman, and co-presenter Gerry Heels, Lowrance Electronics invite everyone attending this FREE event to bring non-perishable food items for the local Georgina Food Bank. Ice Fishing Seminar Presenter, Wil Wegman, won the 2006 Perch Trap Attack on Simcoe, was a member of Team Canada at the World Ice Fishing Championships in 1991, and has had several top ten finishes in the Canadian Ice Fishing Championships. He won the Perchin for MS event with his son Izaak in 2011 and placed 3rd in 2012 when 200 teams competed. Wil has taught ice fishing courses at Seneca College for 20 years, and presents his popular ice fishing seminars from Sudbury to Toronto and from St Catharines to Ottawa. Ice fishing articles by Wil Wegman have been published in Ontario Out of Doors, Outdoor Canada, Real Fishing, In Fisherman, Lake Simcoe Living, Just Fishing,and Lures and Tours. Wegman is excited about returning to Georgina. ice anglers of all skill levels are sure to find the evening both entertaining and rewarding. Ontario Fishing Directory - Lures and Tours Blog: Ice Fishing News! International Ice Fishing Show Features Wil Wegman!